"Do I have or I do not have a greater right on your souls than you yourselves have on them?" "O Muslims! I am a mortal like any of you, and I may soon be summoned into the presence of my Lord. My most precious legacy to you is the Book of Allah and the members of my family, as I have told you before. Now listen to this with attention that I am the Master of all of you - of all Believers. All those men and women who acknowledge me as their Master, I want them to acknowledge (at this point he held Ali's hand and lifted it high over his head) Ali also as their Master. Ali is the Master of all those men and women whose Master I am." Having delivered this message, Muhammad lifted his hands toward the sky, and said:"O Allah! Be Thou a Friend of him who is a friend of Ali, and be Thou an Enemy of him who is his enemy. Help him whoever helps Ali, and forsake him whoever forsakes him (Ali)." "I offer praise and thanks to Allah for all Hisbounties. I bear witness that there is no God but Allah, and He is One, the Almighty, the Perfect. We all depend upon Him. He has no consort, no son, no partner(s). I am one of His slaves but He chose me as His Messenger for the guidance of all mankind. O people! fear Him at all times and never disobey Him. Do not fight but for Islam, and remember that Allah's knowledge encompasses every thing. At this moment Ibada ibn Samit, a companion, rose and asked: "O Messenger of Allah! when that time comes, whom should we look up to for guidance?" "You should follow and obey the People of my House-the Ahlul-Bait. They are the heirs of my apostolic and prophetic knowledge. They will save you from going astray, and they will lead you to salvation. They would invite you towards the Book-The Holy Qur’an, and my Sunnah. Follow them because they are never in doubt about anything. Their faith in Allah is unshakable. They are the rightly-guided ones; they are the Imams, and they alone can save you from misbelief, heresy and innovations. Allah has commanded you to love my Ahlul-Bait. Devotion to them is made mandatory for you (Holy Qur'an: Ch 42, verse 23). They are the ones who are sanctified (Holy Qur’an: Ch 33, verse 33). They are the ones endowed with virtues and excellence which no one else possesses. They are the Chosen ones of Allah Himself. "Know ye all, of whomsoever I am the Maula (Master), Ali is his Maula (Master). O Allah! Be Thou a Friend of him who is a friend of Ali, and be Thou an Enemy to him who is an enemy to Ali. O Allah! Help him who helps Ali, and abandon him who abandons him." The speech was over. Muhammad, the Messenger of Allah, had formally and officially declared Ali ibn Abi Talib to be the Sovereign of all Muslims, and had appointed him as the head of the State and Government of Islam. This event took place on 18th of Zil-Hajj 10 AH (March 21, 632) when the last verse of Revelation was sent down to this earth. The Revelation of Holy Qur'an which had begun in A.D. 610 in the cave of Hira in Mecca, was brought to a conclusion in A.D. 632 at Khumm with the proclamation that Ali ibn Abi Talib would be the Chief Executive, after Muhammad himself, of the Government of Medina and the State of Islam. The Apostle of Allah placed a turban on the head of Ali ibn Abi Talib, thus completing his coronation. All the companions congratulated Ali on this glorious occasion when the Apostle of Allah himself crowned him and proclaimed him his vicegerent and successor. Among those who congratulated him were Umar bin al-Khattab and the wives of the Apostle. Ali is our master and he is the master of all believers. Whatever the Messenger of Allah said on that day, is final; it's the last word, and there is absolutely no room for any argument in it. Curiously and most incredibly, even a man like Amr bin Aas was inspired to dedicate a poem to Ali at Ghadeer-Khumm. He wrote:"The stroke of Ali's sword is just like that oath of allegiance which everyone took on the Ghadeer, and which made everyone bow himself before his (new) authority." If the two verses of Qur’an relating to Ali's coronation, are read in their chronological order, and in their historical context, their meaning will become clear. (1) O Apostle! Proclaim the Message which hath been Sent to thee from thy Lord. If thou didst not, thou wouldst not have Fulfilled And proclaimed His Mission. And Allah will defend thee from men (who mean mischief). For Allah guideth not those who reject Faith. (2) This day I have perfected your Religion for you: Completed My favor upon you, and have chosen For you Islam as your Religion. The coronation of Ali took place within the framework of these two verses of Qur’an. His coronation was such an important matter that Prophet Muhammad, was ordered, in the first verse, to suspend whatever he was doing, and to give his immediate attention to it. He, therefore, ordered all pilgrims to assemble in the plain of Khumm, and told them that Ali would rule them as his successor in the Kingdom of Heaven on Earth. No sooner Muhammad had done so, than the second verse was revealed as a sign of Allah's endorsement of his action. The proclamation of Ali as his successor was the culmination of the lifework of Muhammad. With this proclamation, his mission as Allah's Messenger, was accomplished. He had declared Ali to be his successor on many occasions in the past but at Ghadeer-Khumm, he formally inaugurated him as the future Head of the Islamic State. Between these two verses of Qur’an – one so emphatic in demanding action and the other so unequivocal in its approval of the appointment of Ali as the successor of Muhammad – and the latter's statement: "Ali is the master of all those men and women whose master I am," there is a logical and an obvious correlation. The Meaning of Maula: Friend or Master? Some observers have debated over the word Maula as used by the Prophet when he said: Ali is the maula of all those men and women whose maula I am. They concede that the statement is authentic but they interpret the word maula not as "master" but as "friend." But this was not the intent of the Prophet himself. Did he recall all the caravans and order them to gather in the shadeless plain of Khumm merely to tell them that Ali was their friend? Was it assumed by the pilgrims at the time that Ali was not their friend, and the Prophet had to reassure them that Ali was in fact their friend? Those people who interpret the word maula as "friend," perhaps forget that the Prophet used it in reference to himself before he used it in reference to Ali, and this can admit of only one right interpretation, ie; if Muhammad, the Apostle, is the Master of all Muslims, Ali too is their Master. They also forget that before proclaiming Ali as his successor and the sovereign of all Muslims, the Prophet asked them the following question: "Do I have or I do not have a greater right over your souls than you yourselves have on them? "The answer of the Muslims to this question was an unqualified "yes." This question was prefatory to the Prophet's announcement that Ali was his successor. The question and the announcement were part of the same context, and if read together, they will leave no doubt in the mind of the reader that the word maula means "Master" and not "friend." Abu Ishaq Naishapuri, Ghazali in Sirrul-Alameen, Ibn Kathir, Imam Ahmad bin Hanbal, Shaikh Abdul Haq Muhaddith of Delhi, India, Suyuti in Tafseer Durr al-Manthoor, Tabari in Tarikh-ar-Rusul wal-Mulook and Wahidi in Asbab-un-Nazool. Also, before the revelation of the first verse (5:70), all commandments relating to the Shari'a, such as the daily Prayers, Fasting, Zakat, Hajj, and Jehad – in fact all the laws for the personal, social, economic and political life of the Muslims, had already been given to Muhammad. He had promulgated them, and the Muslims were acting upon them, and they had become an integral part of their lives. The only thing that the Prophet had not done until then, was to formally introduce to his umma, his own successor. The ummah had a right to know who would be its ruler after the Prophet's death. This is what he did when he was commanded to "proclaim the message." The commandment of Allah was most emphatic, and the Prophet could not defer its execution for another moment. With the official inauguration of Ali ibn Abi Talib as the successor of Muhammad and as the leader of all Muslims, the last of the revealed verses was written down in the Holy Qur'an and the gate of Revelation was closed forever. Eighty days later, i.e., on June 8, 632,Prophet Muhammad parted company with his umma, and went into the presence of his Lord. There is no record that he gave his umma any new commandments or prohibitions (Awamir wa Nawahi), during these 80-days. Islam was declared to be complete and perfect as soon as its Prophet appointed Ali ibn Abi Talib his successor. In designating Ali as his successor, Muhammad saw continuity of that mission for which he had labored so untiringly for 23 years. His mission had demanded countless sacrifices on his part and now it appeared to him that all his labors and sacrifices had at last borne fruit, since he knew that Ali would steer the ship of Islam to its destination with the same skill as he himself had done. Muhammad did not appoint Ali as his successor merely because he was his cousin, his son-in-law, and his favorite disciple; nor did he select him because of Ali's personal qualities. 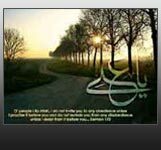 The timing of the revelation of the last two verses of Holy Qur’an (5:70 and 5:4), the events that transpired during the interval of these two revelations, and their correlation, leads to only one conclusion, ie; the choice of Ali as the successor of the Prophet of Islam, was made in Heaven. Ali was the symbol and the manifest expression of the Truth of Islam, and he was the first witness of the Truth of its Prophet. Muhammad, the Messenger of Allah, availed of every opportunity to call attention of the Muslims to the sublime rank of Ali. In one of his most famous Hadith he said that his relationship with Ali was the same as that of Moses and Aaron with the difference that Ali was not a prophet. Sa'd ibn Abi Waqqas reported that Allah's Messenger left Ali ibn Abi Talib behind him as he proceeded to Tabuk, whereupon Ali said: "Allah's Messenger, are you leaving me behind with women and children?" Thereupon the Prophet said: "Aren't you satisfied with being unto me what Aaron was unto Moses but with this exception that there would be no prophet after me?" This hadith has been narrated on the authority of Shu'ba with the same chain of transmitters. Amir b. Sa'd b. Abi Waqqas reported on the authority of his father that Muawiya ibn Abi Sufyan appointed Sa'd as the governor and said: "What prevents you from cursing Abu Turab (Ali)?" He said: "It is because of three things which I heard Allah's Messenger saying about him that I would not curse him, and if I were to find even one of those three things, it would be dearer to me than red camels. And I also heard him say on the Day of Khyber: 'I would give this banner to a man who loves Allah and His Messenger, and Allah and His Messenger love him.' He (the narrator) said: We were anxiously waiting for it when the Prophet said: 'Call Ali.' He came and his eyes were inflamed. He applied saliva to his eyes and gave him the banner, and Allah gave him victory. "Let us summon our children and your children." Allah's Messenger called Ali, Fatima, Hasan and Husain and said: 'O Allah! They are my family.'" The Prophet Moses prayed to Allah to give him a Minister from his own family. He did not want a minister from among his companions and friends. He prayed that Aaron, his brother, would be his Minister, and would be a source of strength to him. Allah answered the prayer of His Apostle Moses, gave him his own brother, Aaron, as his Minister, and made him a source of strength for him. Muhammad, the Last Messenger of Allah, also selected his Minister from his own family. His choice was Ali, his brother. Ali added to his strength, and shared his task with him, just as he had promised to do, many years earlier, at the feast of Dhu'l-'Asheera in Mecca in the assembly of the elders of the clans of Hashim and Muttalib. Allah Himself appointed Aaron as Minister. It was not the umma (the people) of Moses which appointed his Minister. Muhammad did not deviate from this practice of the apostles and prophets of Allah. He too did not leave the Muslims leaderless, and appointed his brother, Ali, as their leader and ruler after him. Though Aaron was divinely chosen to be the heir and successor of Moses, he died within his lifetime, thus necessitating the selection of a new leader. The new leader was Joshua. Like Aaron, he too, was the divinely commissioned successor of Moses, and the umma had nothing to do with his selection. After the death of Moses, his successor, Joshua, led the Israelites to victory. The policy parameters in the matter of selecting and appointing a leader for the Muslim umma, after the death of Muhammad, the Messenger of Allah, can clearly be seen in the verses of Qur’an quoted above. Ali ibn Abi Talib was the choice of Heaven and all that Muhammad had to do, was to make the formal announcement that Ali would be the leader of the Muslims after his own death. Such a historic announcement by the Prophet, should have been followed by universal rejoicing among the Muslims. But it wasn't so. Though there were some Muslims who were happy but there were many others who were not. These latter had entertained other hopes and had other ambitions. Muhammad's proclamation, so forthright and unequivocal, frustrated all their hopes and ambitions. But they did not give up. So they began to whisper in the ears of the Arabs that the designation of Ali as the Sovereign of all Muslims was an act prompted by the desire of the Prophet to monopolize political power in his own family – in the clan of Hashim – to the exclusion of all others, and that it had nothing to do with Revelation. They figured that if their argument appealed to the Arabs, then they would be able to push them into a mad scramble for power in which they themselves might come on top. These people have not been identified by their names but their existence and their potential for mischief are recognized in the first verse (5:70). The Prophet, apparently, was hesitating to act, being mindful of the massive opposition of many Arabs to the appointment of Ali as the future head of the Islamic State. But he was reassured that Allah would protect him from them; that he should overcome his hesitation, and should declare the vicegerency of Ali ibn Abi Talib. Opposition to the historic announcement at Ghadeer-Khumm was opposition to Muhammad himself. Opposition to him, until that announcement, however, was hidden and inconspicuous; but soon it was to rear its sinister head in his own lifetime.